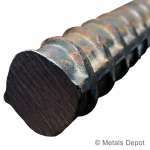 Steel Rebar aka Concrete Reinforcing Bar, is most commonly used to strengthen concrete as an aid to prevent cracking. A615 Rebar helps absorb stress and weight while providing a more even distribution of the tensions caused by concrete's expansion and contraction. Many also use Rebar for ornamental applications because of its unique ribbed appearance and its low cost. Steel Rebar is available in Grade 40 which has a minimum yeild of 40,000 lbs/sqin, and Grade 60 at 60,000 lbs/sqin. 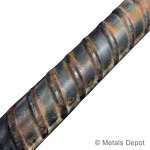 Metals Depot stocks various sizes of steel rebar at wholesale prices in ready to ship precut and mill lengths or you can order online just what you need custom Cut to Size in small or large quantity. Stock lengths may vary +/- 1/2"